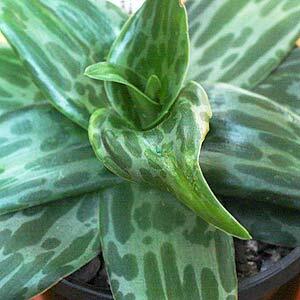 Coming in a number of forms some Ledebouria have striped leaves, some spotted leavesand pthers green leaves. Ledebouria grandifolia is winter flowering plant, Ledebouria socialis is small growing species reaching only 10 – 15cm and is sometimes called ‘silver squill’. Ledebouria cooperi is also known as scilla cooperi. They are very drought tolerant and are classed as bulbous succulents by many growers and as bulb forming perennials by others. They all flower in spring and mostly with blue flowers. With changes to nomenclature some of these bulbs will be better known as Scilla. So L. socialis is synonymous for Scilla socialis. Most species are variable in foliage colour with some having darker and more heavily spotted foliage than others. Some species produce rather insipid flowers, other such as L. floribunda, live up to its name. Tall flower spikes to 30cm in height. L. socialis – Upright green foliage flecked with creamy white. L.petioloata – Broad lance shaped foliage, mid green with dark brown to red specks. small white flowers. L. pauciflora – Upright foliage green flecked with brown. Native to South Africa, try a humus rich well drained soil. They like a little shade and will work well a potted plants. A free draining succulent and cactus potting mix is best. Best in full sun to part shade. Allow the growing medium to dry between watering. These plants are dormant during winter so will need very little water over this period. Use a 1/3 strength fertiliser once in spring. Repot every 3 – 4 years. Easy by removing offsets when repotting. Also possible from seed.